The skin is made up of three layers: epidermis, dermis and subcutaneous, each with its own important parts. The layer on the outside is called the epidermis, the part of your skin you can see. Your epidermis is always making new skin cells that rise to the top to replace the old ones on a 28 day cycle. The epidermis also makes a substance called melanin. Melanin is what gives skin its color. The darker your skin is, the more melanin you have. When you go out into the sun, these cells produce extra melanin to protect you from getting burned by the sun’s ultraviolet, or UV, rays. That’s why your skin gets tan if you spend a lot of time in the sun. The next layer down is the dermis. You can’t see your dermis because it’s hidden under your epidermis. The dermis contains nerve endings, blood vessels, oil glands, and sweat glands. It also contains collagen and elastin, which are elastin. The nerve endings in your dermis tell you how things feel when you touch them. They work with your brain and nervous system, so that your brain gets the message about what you’re interacting with. Tiny dermis blood vessels keep your skin cells healthy by bringing them the oxygen and nutrients they need and by taking away waste. 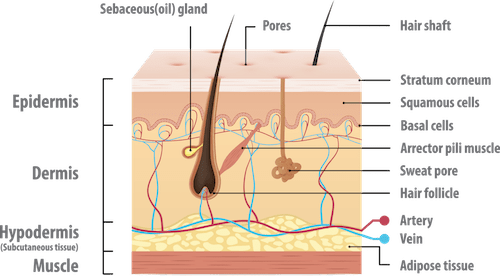 The dermis oil glands (sebaceous glands) are always producing sebum, your skin’s own natural oil. It rises to the surface of your epidermis to keep your skin lubricated and protected. It also waterproofs your skin. The third and bottom layer of the skin is called the subcutaneous layer. It is made mostly of fat and helps your body stay warm and absorb shocks. The subcutaneous layer also helps hold your skin to all the tissues underneath it. After the early months of babyhood have passed the skin of most children has a more than adequate layer of fatty ‘padding’ which gives it a beautiful smooth appearance, often described as having the quality of ‘purity’. All the functions are very active, and because the epidermis is highly translucent, the skin is very well hydrated. Children have more leisure time than they will ever enjoy again and many of them play outside whenever they can, often spending most of the summer outdoors. Due to this, they usually experience long periods of exposure to the sun during childhood, which can have long-term consequences. The care of the skin of small children is almost entirely in the hands of parents or other caretakers. Nevertheless it is never too soon for them to begin to learn about skin care. The skin only needs cleaning, moisturizing, and sun protection.